When it comes to the home nothing tickles my fancy more than an unexpected surprise. You know what I'm talking about don't you? Those moments when you step up onto what you expect to be a plain landing and discover a creative kiddie play zone instead. Or are walking down a hallway and happen upon a beautiful art display. The dining rooms that multi task as eating, office, and storage zones. A bombshell colour in an unexpected place. Stunning details, details, details. 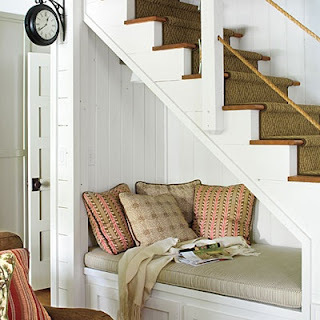 And of course the reading nooks tucked here there and everywhere: under the stairs, beneath a window, or cozy in a bedroom corner. It is that use of otherwise wasted space that really pulls a home together and takes it to an entirely new level of inspiration. Shall we? Pop of colour anyone? This idea of adding a splash of colour to a transitional space by painting an interior door is beyond clever. 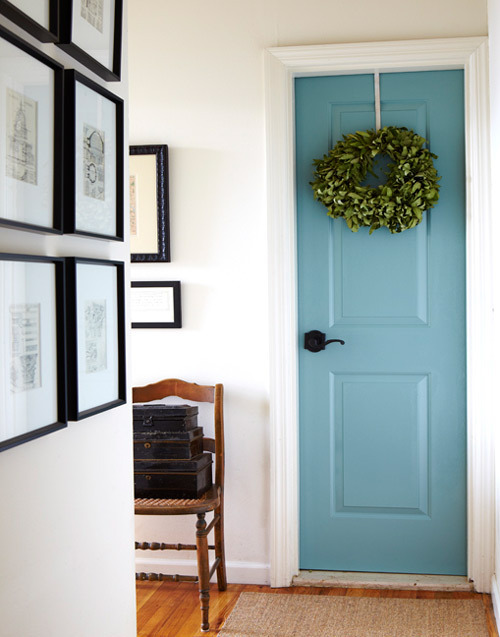 Especially for high traffic areas, such as the front door or between the main house and garage, that are difficult to keep clean in plain white. 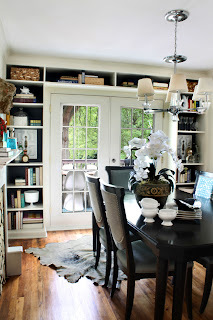 This built-in shelving unit in Kristin's dining room, over at The Hunted Interior, makes me swoon. An innovative yet darling storage solution. What otherwise would have been vacant wall space, give or take a wall hanging or two, is now a functional spot to house dishes, books, pretties, and anything in between. This landing is just right. 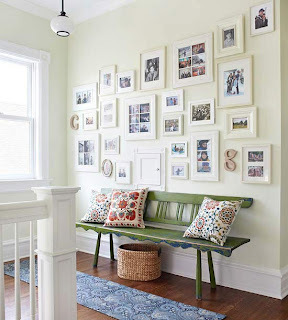 The crisp white walls clad with a plethora of white framed family photos and a bright pop of colour found in the welcoming bench seating bring this space to life. And even though it is not an overly large space it has function and acts as a beautiful transition from one room to another. For more inspiration and tips on decorating a landing, skip on over to visit Leanne at The Fancy Life. 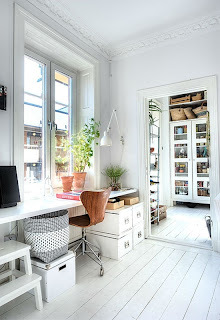 I like the idea of having the home computer set up in an easily accessible and area open to the rest of the living space rather than tucked away. This long narrow desk is a great solution. 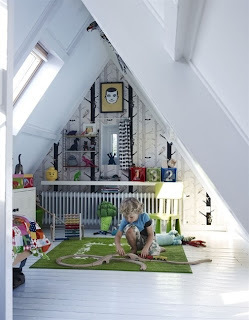 This attic nook with its low ceilings would likely not be a great hang out for you. But for the kiddos it would be an idyllic play place tucked out of the way. The details bring this small space together to create a mighty world for an imagination to sore. And on that note. I hope very much that these inspirations have allowed your imagination to sore about your own home. Maybe they will act as leaping off points to bring those transitional spaces between here and there to life! And if you are ahead of the game and have already gotten started I'd love to hear about your ideas. 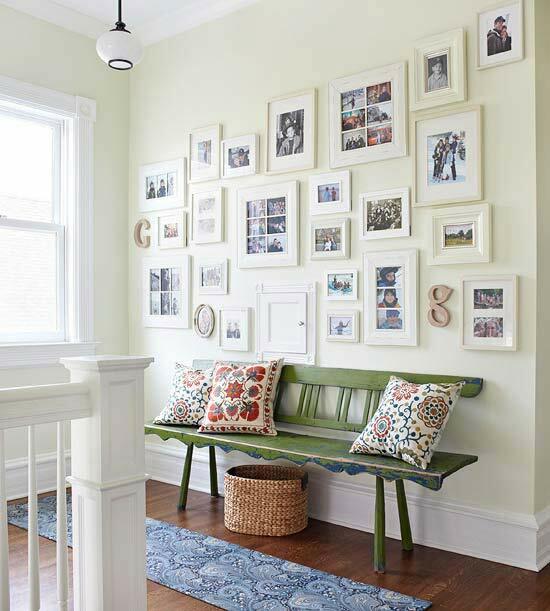 What are your plans to make each space functional and eye catching? Details please!